Thrusting abruptly 400 feet out of the Pacific Ocean, Point Loma ("Hill Point") is an imposing promontory protecting San Diego Bay and its narrow entrance from ocean storms and waves. It was formed about a million years ago, as part of a general geological uplift in the Southwest. At that time, it was an island. 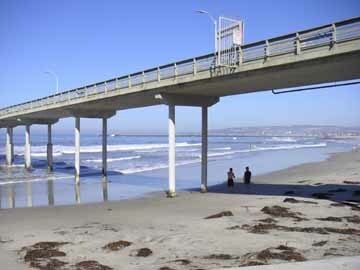 Since then, the San Diego River has spent centuries bringing down tons of soil and rubble to connect it with the mainland. Today a series of heavily eroded, and still eroding, cliffs establishes the border where the western shore of Point Loma meets the Pacific Ocean. 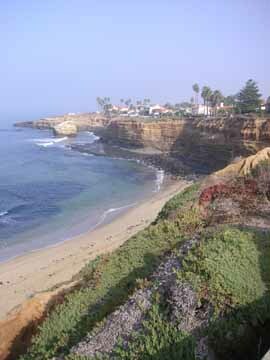 This area is known as Sunset Cliffs. 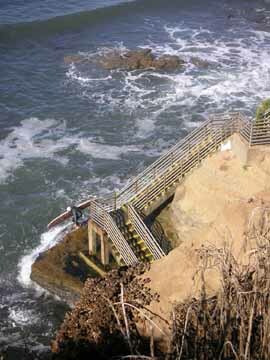 This walking tour follows the ocean-front road along wave-carved cliffs to the community of Ocean Beach. 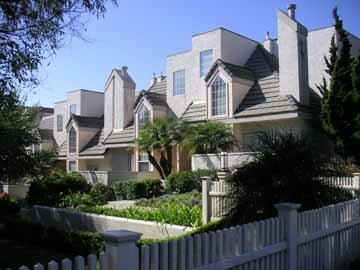 When you reach Ocean Beach, the route leaves the shore and follows a residential route. You complete your walk 2000 feet out over the Pacific Ocean, at the end of the longest fishing pier on the West Coast. Distance: Two and a half miles. Time: An hour and a half, one way. Note: This walk does not bring you back to your starting point. Begin your walking tour along Sunset Cliffs 60 feet above the Pacific surf, at the intersection of Sunset Cliffs Boulevard and Ladera Street. To the south of this intersection is Sunset Cliffs Natural Park, a conservation area. The grove of trees you see in the park is eucalyptus, an import from Australia that has thrived in the Southern California climate. Offshore, you'll probably be able to make out some kelp beds. Look for areas of water with an orange cast. Closer to shore, the waves make this a popular area for surfers. Next look up at the homes on the Point Loma hillside -- the hillside is steep enough that the homes have a good view of the Pacific. 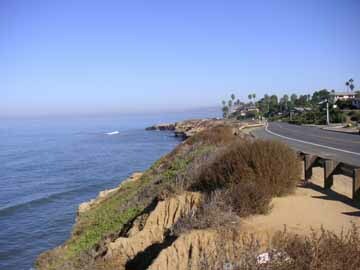 Now head north along Sunset Cliffs Boulevard. The deeply sculpted Sunset Cliffs pay tribute to the immense power of erosion. Again and again you pass areas where erosion has encroached on the land enough that keeping a path where pedestrians can walk has required narrowing Sunset Cliffs Boulevard. The City of San Diego has attempted to slow the erosion by placing rocks at the base of the cliffs, but the forces of erosion are winning the battle. Also as you walk, keep your eyes open for the many seagulls, shore birds, and other waterfowl that live along the cliffs. For example, just before you reach Froude Street you'll find an offshore rock popular with pelicans and cormorants. 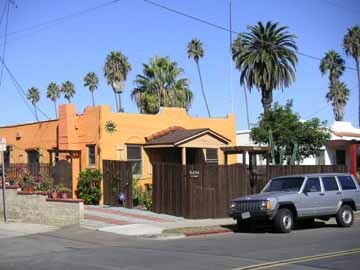 At Adair Street, Sunset Cliffs Boulevard leaves the shore's edge, and you enter Ocean Beach, a community of pastel-colored homes. Continue along Sunset Cliffs Boulevard, turning left at Orchard Avenue. Ocean Beach has mainly older homes, although you will see some new construction. Turn right at Cable Street. Walking north on Cable Street, look right at the corner of Del Mar Avenue to see two spreading Monterey cypress trees, one on each side of the street. 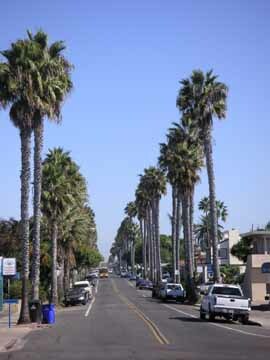 These trees do well in areas with cool, moist summers, and have been planted widely along the California coast. Turn left at Santa Cruz Avenue. You can still see the marks where trolleys once glided down this quiet residential street. Turn right at Bacon Street. From Bacon Street, turn left at Niagara Avenue. On your right, on the side of a building formerly home to an electronics company, you'll find a "History of Electricity" mural. Continue along Niagara, out to the Ocean Beach Pier. Stroll along this beautiful pier, where a concrete footway makes the walking easy, and green wood railings contrast subtly with the blue-green water below. Stop along the way to see what the fishermen are pulling in as the day's catch, to rest on one of the benches, or to watch the swimmers at the water's edge, the surfers waiting for their waves, and the ocean swells rolling in toward the shore. At the end of the pier you can buy bait, rent tackle, and do some fishing of your own (no license required). Or you can merely enjoy looking around. Catches here include perch, bonito, barracuda, sharks, sting rays, and halibut. 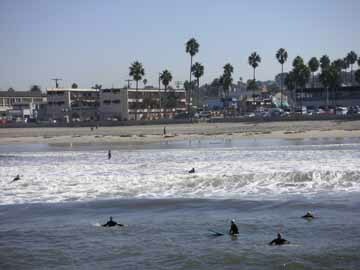 One block north of the pier is Newport Avenue, the main commercial area of Ocean Beach.